The reply, if one was given, was usually short, direct, and often needed a lot of thinking and reflection in order to be understood. The reply was always directed to the person asking the question. The sayings of the elders were designed to open the heart of the novice, to challenge his perceptions, and eventually to lead to conversion. The reply was designed to cut to the heart, like a sharp axe cutting through wood. These sayings were collected and have been preserved in a collection called the Apothegmata Patruum, the Sayings of the Fathers. At first, they were passed on orally, then they were written down. Finally, they were all collected into two volumes, The Alphabetic Collection, where the stories were arranged according to the names of the characters involved; and The Anonymous Collection, where stories were arranged according to themes. There are nearly 3,000 of these sayings. iii) his Spiritual Father (Abba). 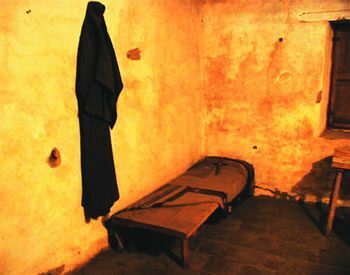 The cell of the monk was important not only as the monk’s shelter, but as a point of stability, as the place where he faced himself, his motives, his desires and his fears. It was the place of battle; the fiery furnace of Babylon. The quest for God was also a voyage of discovery. The Scriptures were the one companion that the monk had in his cell. His first task was to memorise all the Psalms and the New Testament. Some monks were known to have been able to recite the whole Bible by heart. The Ladder of Divine Ascent or The Ladder of Paradise, a 12th-century icon described by St John Climacus. The Spiritual Father was the guide of the monk on his journey from self-deception to discipleship, with Jesus, to the Father. The disciple was expected to open all his thoughts to his Spiritual Father and to remain obedient to him. A man, no matter how prudent, may easily go astray on a road if he has no guide. The man who takes the road of the monastic life under his own direction may easily be lost, even if he has all the wisdom of the world. A ship with a good navigator comes safely to port. A soul with a good shepherd climbs easily heavenward, even if it has earlier done much wrong. So, the monk stayed in his cell; he recited the Psalms one after the other during the week and he memorised them; he did manual labour such as weaving flax baskets; he fasted; and once a week he joined his companions in celebrating the Eucharist and in taking part in a common meal. 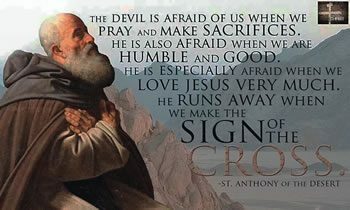 The most famous of the Fathers of the Desert was Anthony. Though not the first to enter into the Desert, he is regarded as the first ‘Father of the Desert,’ and is known as the ‘Father of Monasticism’ in the Church. Set your mind on following the path of the saints. Prefer a simple style of life. Wear unremarkable clothes. Eat simple food. Behave in an unaffected manner. Don’t strut around as if you were important. Speak from your heart. Before you pray, first forgive all those who have offended you; then pray. Only then will your prayer rise up into the presence of God. If you do not forgive, it will simply remain on the earth. A young monk once went to Abba Paphnutius, because he was feeling unsettled in the desert. He was tempted by the thought that he was achieving nothing. Abba Paphnutius said to him, “Go, stay in your cell and make one prayer in the morning, one prayer in the evening, and one prayer at night. And when you are hungry, eat, and when you are thirsty, drink, and when you are sleepy, go to sleep. And remain in the desert. The young man was not convinced. He wondered to himself, “What kind of life is that for an enthusiastic Christian?” So he went to Abba John, who changed the advice of Abba Paphnutius, by saying, “Do not make any prayer at all; just stay in your cell.” Finally, the young man went to Abba Arsenius, who simply told him to do what the Fathers had said.